Georgina wrapped the antique string of pearls around her finger. Coiling and constricting, as the chandelier dripped delicate crystalline rain and soft arias floated down from hidden speakers. She stared at the milky baubles strangling her finger, willing them to impart their years of wisdom. If you go looking for trouble, you’ll find it. You have a tendency to self sabotage. You believe you don’t deserve to be happy or to be loved. Gerald is just the man for you Georgie. No more of these online tossers. She had sworn she’d been on her Last Blind Date Ever, but Tom was persuasive. That’s how her neighbour topped the sales every month at his work and how she came to be dining with his friend Gerald. Initially Gerald’s reluctance to speak about himself put her at ease. It was relief to find he wasn’t an egomanic who could talk under wet concrete. But something, she wasn’t even sure what, hit her radar as they cleared away the main course. Something beyond first date nerves, shyness or someone who genuinely found other people more interesting. As she savoured the decadent crème brulee, tapping through the fragile sugar crust to the vanilla-bean custard below, she’d asked the question. He deflected and then excused himself to the men’s room. Georgina knew one thing – married men avoided talking about their lives engineering conversation detours to avoid being caught out in a lie. Georgina also knew married men preyed on desperate women. Tom had explained it was palpable the vibes which came off a woman who was desperate. She wasn’t like that any more, filling her time with life drawing classes, indoor cricket and French cooking. Filling her well, learning to love herself and longing for only what she could provide for her own happiness. The tip of her finger began to throb, turning plum-coloured as the blood banked up on the wrong side. Just one peep in his wallet. She’d never done it before, though she should have. Invading a man’s privacy in such an underhanded and premeditated fashion always seemed wrong, even when her gut feeling assured her she should. This time, she’d save herself the time and the heartache, fed up with being lied to and strung along by double-life cretins. If Gerald was married she was going to find out – post haste. Georgina scrutinised his jacket, looking at the symmetry of the cut and the way it fell. One side seemed heavier. She bet his wallet was in that pocket. Pulling his chair around to her left side gave her the opportunity to take it. Her fingers brushed the silkiness of worn leather. She hesitated. Rather than get stuck in a circular mental argument she wrapped her fingers around it, sliding it from his pocket, into her lap. Looking down, she pretended to be scrutinising the linen napkin she’d been careful not to soil. Biting her bottom lip she opened it. Her stomach lurched. His wife and three kids smiled up at her. What the hell was Tom doing setting her up with a married man? “Pardon?” Gerald said, as he eased himself into the seat beside her. Georgina looked up at him, uncomfortably close now. One hand folded over the other in her lap, hiding her crime. His lie sat between them like an uninvited dinner guest. Georgina knew the place. A date last year had taken her there and expected her to go down on him in return for the cheap, nasty Chinese feed and ticket he’d paid for. Her nails dug into the worn flesh of the wallet as she fought to keep her composure. This was no cheap Chinese dive where you could make a scene. She was going to walk out alone, and with her dignity intact. 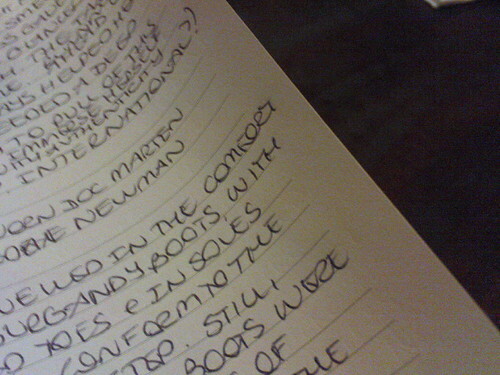 “Monsieur,” the maitre de said, arriving at their table, placing a slim leather folder beside Gerald. Georgina held her breath as she saw his hand sink into the jacket pocket a look of temporary relief softening his face. But her fingers refused to yield. “Oh… no!” He looked perplexed. Gerald’s face froze in the high beam smiles of his family, his adam apple pumping. Next would come the ‘woe-is-me’ monologue to justify this date. But he said nothing, stood and slipped his jacket on. He took five $50 notes from his wallet and put them inside the bill folder, then took a few faltering steps from the table, stopped as if to turn, but continued on in the direction of the men’s room. “He brings Mrs Levitt here?” Georgina felt the blood rising in her cheeks at both the audacity and the complicity. 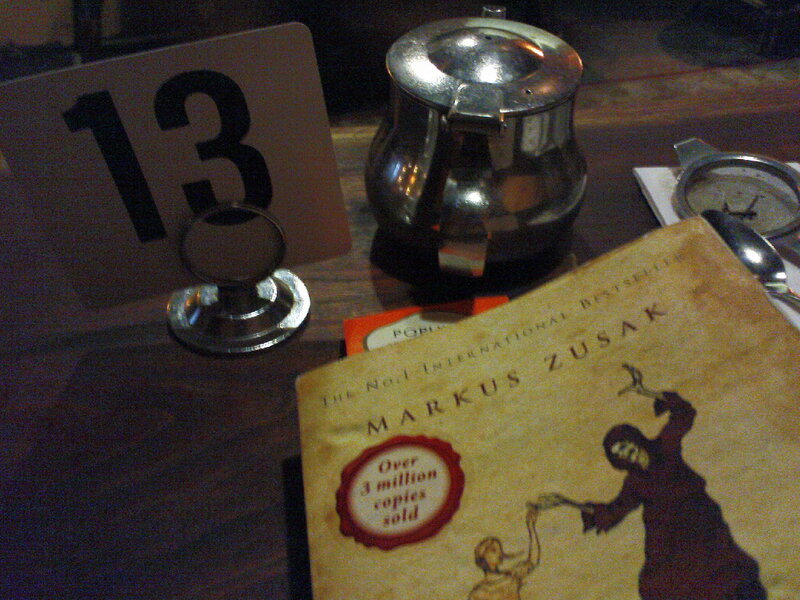 This was inspired by the the [Fiction] Friday #138 prompt from a fortnight ago. #129/365, originally uploaded by tigerlily4865. 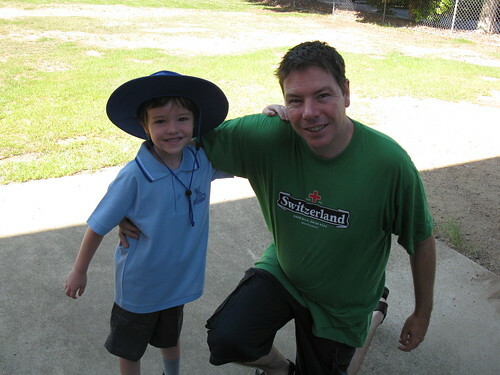 Today I became the Mum of a primary school student. More tears on my part and feeling sad that it is the end of an era and the start of another. He was VERY brave. Looking forward to hearing the joys of school this afternoon. The best summation for me was a mixture of relief, grief, happiness, freedom and emptiness. You know the feeling you get in your tummy… but you never tell anyone about. That was me! #127/365, originally uploaded by tigerlily4865. Every year when we go to the Book Fair we find something interesting in the pages of one book. 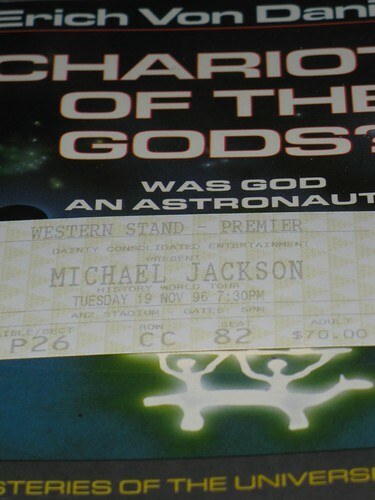 This time is was a ticket to Michael Jackon’s 1996 World Tour ‘History’. Well it really is history with the passing of Jackson last year. Dave wondered how much something like this would go for on eBay? I wondered if the person who originally owned the book was doing field research on whether or not Jackson may have been an alien in disguise? #128/365, originally uploaded by tigerlily4865. The moon, the moon the big fat moon… Waxing towards full. 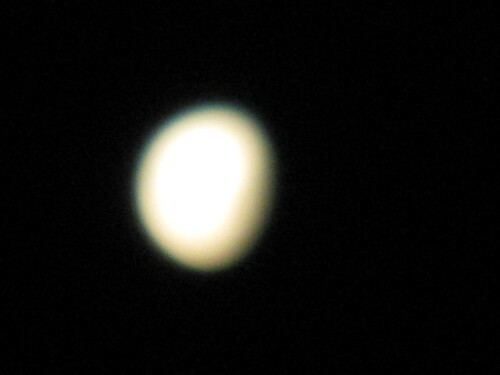 I was surprised how hard it was to keep the apparently still moon in the frame and get a shot. Have admiration now for whoever filmed the Eclipse in the Maldives now. #126/365, originally uploaded by tigerlily4865. 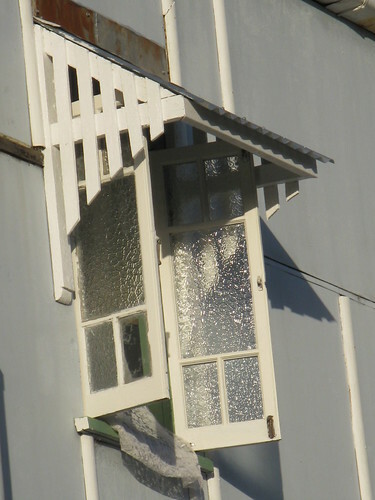 Our old housemate has moved across to South Brisbane – this was one of the windows in the house next door. I love the afternoon sun hitting the fancy glass, and the curtain patient on the window sill for the next breath of wind to fly again. #123/365, originally uploaded by tigerlily4865. 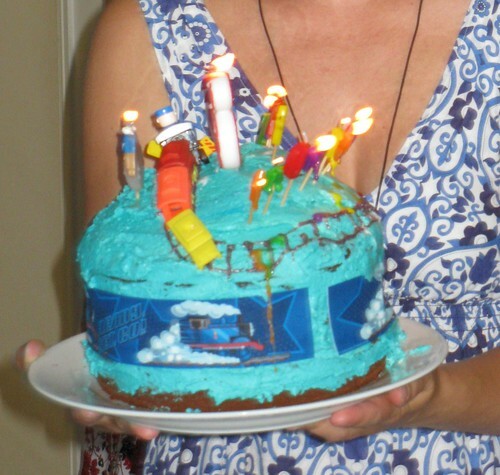 It was another birthday party… this time with a Thomas cake and LOTS of candles. Happy 6th Birthday Liam and Happy Birthing Day Laney.